If you want to see gorillas you can go to the zoo any time you like. But if you want gorillas to see you, it’s important to pick the right day. You need to go early on a weekday in the middle of winter, when the giraffes have all gone, and the butterfly enclosure is an empty skeleton, and the zebras stand transfixed against the snow. There is hardly anyone there, except the people who work in the place. Under the huge warm dome of the Tropical Rainforest, the western lowland gorillas are going about their day. 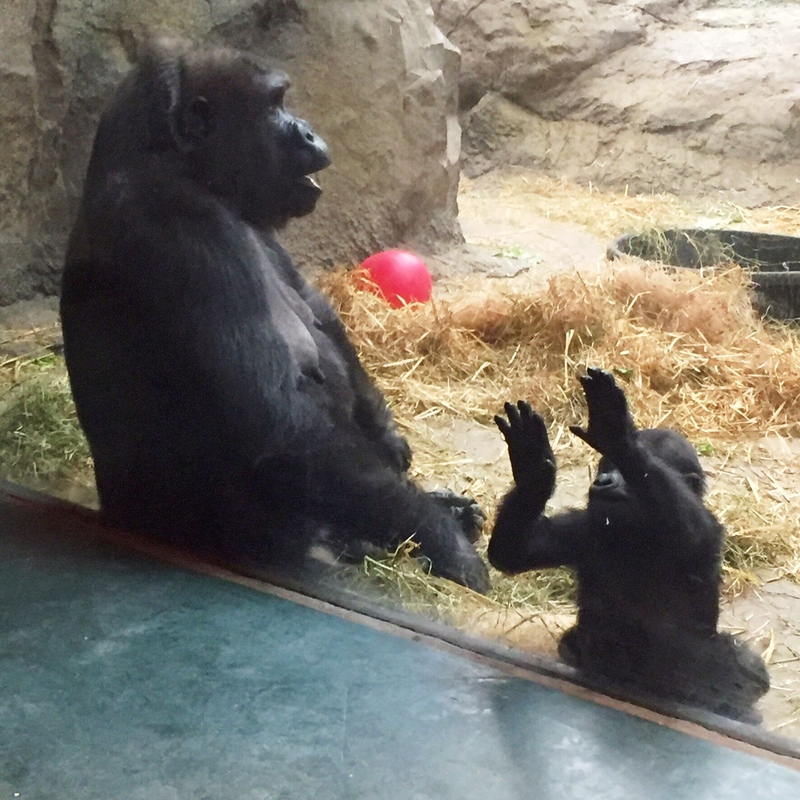 The older female gorilla is sitting in the corner next to the glass. It’s her spot. JR and I sit down beside her, on the other side of the glass. The older gorilla normally ignores most of the people who pass by her enclosure on an average day. Now she gives me a sidelong look. Perhaps it’s because I’m wearing a large – and some would say peculiar – woolen pompom hat. Or maybe it’s because we’re the only humans in sight. She picks up a ball and bounces it off the glass in the direction of my head. All’s quiet in the Tropical Rainforest. The only sound is the splash of the waterfall fountain. Out of our line of vision, the young male gorilla has been sneaking up on us. Now he runs forward, smacking the glass and making me jump. Then, a moment later, the alpha male strides up. He’s got a blanket slung around his vast shoulders. The blanket is purple. Even without it he’d look like an emperor. The alpha male stares at him. JR averts his eyes. There’s something about these animals that’s incorrigibly alarming. Even here, in a Tropical Rainforest that is neither tropical nor rainy, nor even a forest, surrounded by plastic toys, with the distant sound of a fake waterfall splashing into a fake pool, behind glass thick enough to stop a truck, they demand respect. It’s their size of course, their physical power. But mostly it’s the way they look at you. Having received JR’s abject fealty, the alpha male strides off and the young mother approaches, with her eight-month old baby attached. The baby unravels itself from her mother’s leg and teeters towards us. She places her palms on the glass, feeling the surface, still uncertain of the edges of her world. If I reach out a few inches, I could press my own hands up against hers on the other side of the glass. But I don’t. The mother is looking at me with a hard, warning stare. The glass between us thins. Other boundaries too. I think: Why doesn’t she like me? Her eyes are unblinking. They seem to say: What have you done to deserve it? It’s a humbling thing to be looked at by a gorilla. I didn’t know. They never looked at me before. amazing encounter in the midwinter tropics. nice!